Hey gang! I just wanted to get a quick post in just to say "hi" to you all and catch up on recent happenings. Life as been ultra busy lately, but I'm looking forward to a long holiday weekend, hopefully filled with fun projects to share with you all soon! I spent last weekend, Thursday-Sunday in Ohio, seeing family and friends. While there, I was able to visit one of my favorite events growing up: The Great Darke County Fair! Held in my hometown of Greenville, the fair was always a must-visit for me (at least a few times during its nearly two-week run). I loved playing games, riding rides, people watching and of course eating all the tasty fair food. Sadly, I hadn't been back in years, so I was excited to get the chance to visit again. Only this time I went back for a special occasion: Eric and I got our engagement pictures taken there! I got the idea to have a fair-themed engagement shoot months ago, and thankfully our incredible photographer, Look Here Photography, was ecstatic to hop right on board. You know me - I'm not one to do anything "typical" so I was so excited to get some different-style engagement photos with a fun theme. I loved the idea even more because because the photos will pay sort of an homage to my hometown roots in Ohio, as the wedding will be in Wisconsin. The shoot was last Thursday evening, and we shot for nearly four hours, so obviously there are a lot of photos to sort through. I don't have anything to show you now (although if you visit Look Here's Facebook page now, you can take a sneak peek at one of our photos from the night! ), but with our photographer's blessing I'll share a few of our favorites when they're all done. After our engagement shoot, we came home, crashed hard, and the next morning I dropped Eric off at the airport to return back to Milwaukee alone. I had serious business to get down to. Friday-Sunday were spent on Kelleys Island in Lake Erie for my friend Kelly's bachelorette party! I met Kelly my freshman year of college and we've been close ever since. She's one of the most fun people I know, so I knew this would be a bachelorette party for the books. That's Kelly in the middle left, long with my friends Jenna and Taylor. It was so great seeing friends I hadn't seen in over a year, and meeting new friends, too! I had an absolute blast, and can't wait until her wedding in October! With weddings being the talk of the weekend, I realized I need to get cracking on some wedding projects of my own. I hope to have a few new things to share with you coming up shortly! Until then, hold tight... things are only going to get more interesting in the coming months. You know those projects that, in your head, seem so easy you guarantee you'll finish them in just an afternoon? This backsplash is one of them. Except it didn't turn out that way. After a long summer of things being very quiet on the home-improvement front, we began our subway-tile backsplash almost three weeks ago. We bought our materials at Home Depot, read/watched a few tutorials and started putting tile to mortar to wall. We purchased a "tile installation kit" from Home Depot that came with a notched trowel and a grout squeegee. At the corners of each tile we placed a 1/16 spacer. Once we got all our full tiles up on the wall, we were excited about how things were turning out. But we soon realized that, thanks to a couple of awkwardly positioned electrical outlets, we'd have to be doing a lot more tile cutting than we'd planned on. After a weekend away, we returned clear headed and ready to finish our backsplash. Eric diligently got to work doing the extremely tedious task of measuring and cutting the tiles to fit, using a wet saw. Honestly, everything about tiling a backsplash (especially in a small area, with no intricate patterns to work in) is very easy.... except the measuring and cutting part. I have to give Eric a million high-fives for his patience (though it waned throughout the day) in doing all the cutting and measuring. While he got to work on this part of the project early Saturday morning, I was out on a long run, enjoying the beautiful weather.... So, bonus points to him for being diligent. Eric began the whole process at around 8:30 a.m. I returned from my run at around 10:30 and while he'd made progress, I could see he was frustrated. The previous owners installed our kitchen cabinets just a little unlevel, and because of this Eric had to cut and re-cut a few tiles that would line the cabinets to make them even. As he cut the tiles, I mortered them up and stuck them to the wall (using the notched trowel held at a 45-degree angle). Teamwork! At around 2:30 that afternoon, Eric was spent. He threw his hands up, grabbed a beer and announced that he was done. He'd had a long, frustrating day, so he deserved some time to unwind. The next day we decided to tackle the next step and finish everything up. I told Eric to relax, and that the grouting detail was up to me. I feel a little bad, because grouting is probably the easiest step of the whole process. Just dip your squeegee into the bucket of grout and spread it over the tiles, making sure to hold the squeegee at a 45 degree angle, spreading diagonally to ensure grout gets deep down into the crevices. And honestly, after a while I got a little dirty and just started slopping the grout into the gaps with my fingers and then smoothing with the squeegee. I found it was a little easier/more precise/kinda fun in the long run. 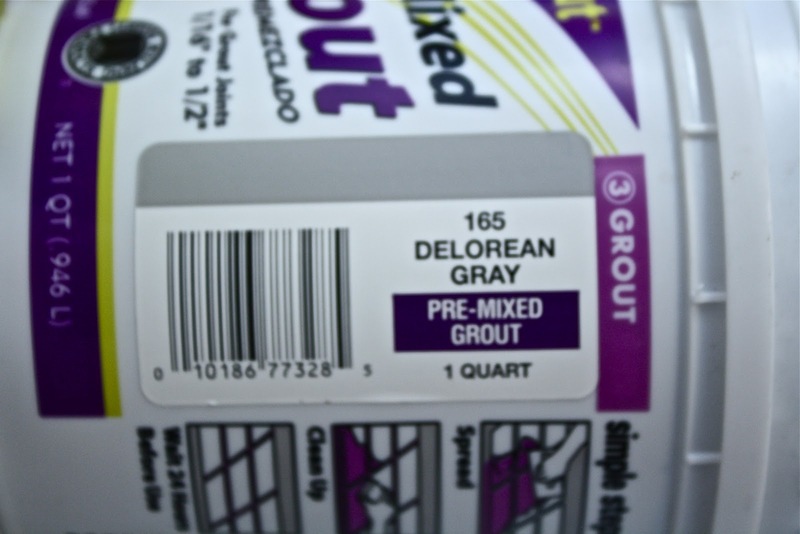 Also: Check out the name of our grout color! We knew we wanted a shade of gray (ugh... spare me the obvious "Which shade out of 50?" joke...), but once Eric saw our kitchen had the option to be sporting DELOREAN gray, that sealed the deal. After I applied grout to about a two-foot square section of the tile, I wiped off the excess with a damp sponge, then continued on. After letting it all sit for four hours, I went back with the lightly damp sponge and cleaned off any remaining haze from the tiles. And with that, our kitchen's back has been splashed. We didn't have a huge space to work with, but I think this little bit of a change makes a huge impact. Doesn't it make the whole room seem brighter? I also like how it just makes everything seem more polished and all grown-up like. And we still have about 20 tiles, 1/3 tub of grout and a TON of caulk left.... so cheap! While it was a bit more tedious than we originally thought it would be, we're so happy we finally knocked this project out. We love the look of our new backsplash, and if you've got the patience to do all the measuring and cutting, it's really not a tough job to do on your own. It feels great to have another project from our "home to-do list" checked off! 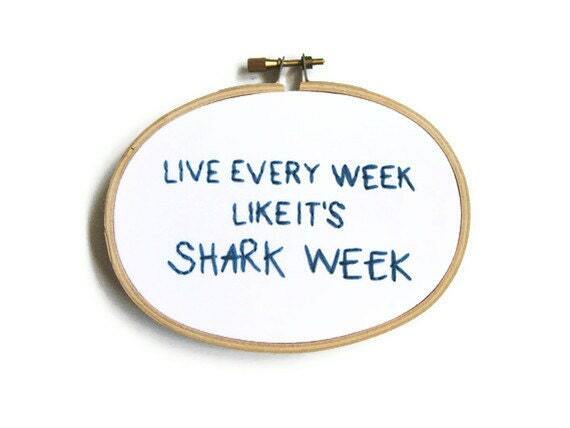 Have you checked anything off your list this summer? We've had a hard time motivating ourselves to tackle any other large projects this summer between the intense heat and squeezing in all the fun we can! Oh, they grow up so fast... Today is Mr. Pancakes' THIRD birthday! Eric and I were talking about it over the weekend and we kind of feel like he should be older than three, because we have a really hard time remembering life before him. It seems like he's been part of our family forever! How do we know his birthday is today? When we adopted him from the Humane Society, they told us he was probably born in mid-to-late August. We figured August 22nd seemed like a good estimation, so it became his birthday. In the past, I've tried celebrating Mr. Pancakes' birthday by serving him Fancy Feast or giving him a new toy to bat around, but he won't touch wet cat food (he won't even eat fresh salmon off the grill. I tried giving him a piece once and he just sniffed it and walked away) and he's way more interested in rubber bands and little pom-pom balls scattered around the house than "proper" cat toys. He got an early birthday present last week when a package I ordered was shipped with two HUGE rubber bands. He's been carrying those around the house all week to play with (we keep finding them in random places), so suffice it to say he's happy with his new "gifts." The one thing I know he will not be getting is a birthday card that makes a meowing sound. A friend (and my maid of honor!) sent me a birthday card this year with a big cat on the front, and when you open it, it "meows" the "Happy Birthday" song. The first couple times I opened it, I noticed Mr. Pancakes' eyes get HUGE. Then I put it down to his level and he absolutely freaked out. Every time I let it play for a while, Mr. Pancakes gets horrified and runs away. I shouldn't laugh at his utter terror, but his reaction is priceless. So, happy third birthday, P-Cakes! May you not be startled by loud noises and may your day instead be filled with head scratches, rubber-band fetch and your beloved Whisker Lickins treats. Here's to many more, little guy.